nd He it is who appointed the stars to you, that you might guide yourselves by them through the darkness of land and sea. –The Qur’an, Sura VI, verse 97. 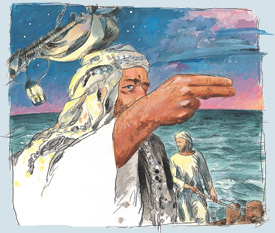 Ahmad ibn Majid was born in Oman, probably in 1432, the year Zheng He’s junks docked at Jiddah. The last of his approximately 40 known compositions, a poem on the heavens, is dated 1500, the same year Pedro Álvares Cabral discovered Brazil on his way to India by way of the Cape of Good Hope—thus linking Europe, the New World, Africa and Asia in a single voyage. Ibn Majid must have died soon after that date, his life spanning the most critical century in the history of the ocean whose currents, winds, reefs, shoals, headlands, harbors, seamarks and stars he spent a lifetime studying. His most important work was Kitab al-Fawa’id fi Usul ‘Ilm al-Bahr wa ’l-Qawa’id (Book of Useful Information on the Principles and Rules of Navigation), written in 1490. It is an encyclopedia of navigational lore: the history and basic principles of navigation, lunar mansions, rhumb lines, the difference between coastal and open-sea sailing, the locations of ports from East Africa to Indonesia, star positions, accounts of the monsoon and other seasonal winds, typhoons and other topics for professional navigators. He drew from his own experience and that of his father, also a famous navigator, and the lore of generations of Indian Ocean sailors. The Book of Useful Information deals not only with the monsoon system, but also with the finer details of local wind regimes. The prevailing winds in the Red Sea north of Jiddah were among the most difficult, Ibn Majid writes, because they blew from the north all year round. Normal practice was to sail to Jiddah and there either transfer cargo to smaller boats, whose pilots were experienced in the local conditions between Jiddah and Suez, or to send car- goes overland. Even to Jiddah, and to ‘Aydhab on the Egyptian side, access was only possible during the northeast monsoon, between October and mid-March. Other specialized knowledge was needed to sail elsewhere: south of the equator, for example, where the monsoons gave way to the trade winds. The China Sea too had its own wind regime. Only a lifetime of sailing could teach a mu‘allim, or master navigator, the skills upon which the entire trading network depended. By Ibn Majid’s time, four major innovations—two of them from China—had improved ship design and navigation. Around the year 1000, the Chinese developed the axial stern-post rudder. It replaced the long “steering oar,” which was always awkward to handle and prone to snap in heavy seas. The hinged rudder with its tiller made sailing easier and safer, especially in bad weather. It was not until the 13th century, however, that it reached the Mediterranean, probably about the same time as the compass, or a little later. From the Arabian tradition of seafaring came the lateen sail, which had long allowed Arab dhows and other ships to sail closer to the wind than their Mediterranean counterparts. By the mid-15th century, however, the Portuguese and Spanish had combined it with their own square-rigged tradition, and it proved essential to their successes in both Asia and the New World. Another method of measuring the Pole Star’s height above the horizon was by using the kamal. 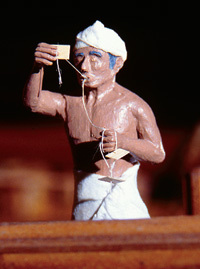 The kamal was a small rectangle of wood attached to a cord which was calibrated by knots along its length. Each knot represented the latitude of a particular port. The navigator held the cord in his teeth at a certain knot and held the kamal at eye level at the cord’s full length, aligning the lower edge of the rectangular plaque with the horizon. When the upper edge intersected the Pole Star, the ship was on the latitude of the desired port. Distance east and west was measured by time, not in hours but in zam, three-hour increments—the length of a watch on board—measured by the burning of a standardized stick of incense. Portuguese navigators, on the other hand, found latitude by measuring the altitude of the sun, rather than the Pole Star, and estimated their easting and westing by dead reckoning. 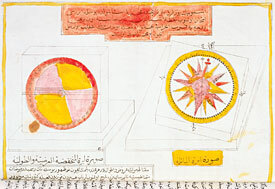 Under King Manuel, tables of the sun’s declination were compiled for mariners, based on similar tables prepared by Arab scholars in the mid-13th century. 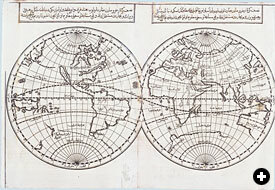 When the first European printed work on navigation appeared in 1509, it contained a method of “raising the Pole Star” that almost certainly came from Indian Ocean navigators, for the East–West dialogue on this subject had begun almost immediately: In 1499, Vasco da Gama’s pilot had a long conversation on navigation with the Gujarati pilot who led the Portuguese to Calicut. Similarly, the earliest European maps of the Indian Ocean give the position of ports in pulgadas—“fingers”—and the Chinese used this method as well. The development of the compass derived from knowledge of the properties of the lodestone, whose ability to attract iron had been known since remote antiquity. The late Joseph Needham showed how Chinese diviners in the second century bc cast lodestone spoons to align north-south. From this came the invention of the magnetized needle, which Ibn Majid attributed to the mythological patron of Indian Ocean sailors, al-Khidr, who, according to legend, had guided Alexander the Great over land and sea. The compass proper is also a Chinese invention. The earliest known mention of it occurs in 990, and a Chinese encyclopedia of 1135 describes one in the shape of a wooden fish with a piece of magnetite inside that was floated in a bowl. In 1242 an Arabic text describes a compass seen on a voyage from Syria to Alexandria that was in the shape of a hollow iron fish that similarly floated on water in a bowl. 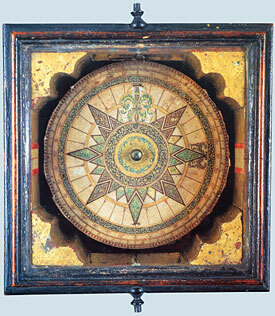 Toward the end of the 13th century someone—probably an Italian—fixed the magnetized needle to a wind rose. 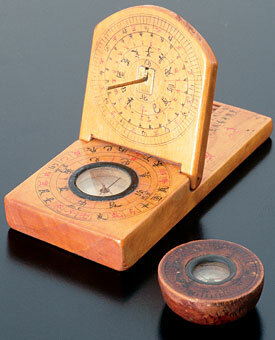 This created the basic form of the compass we know today. Traditionally, the Mediterranean wind rose had 16 parts, but with the compass this developed into a 32-part rose, allowing, for the first time, very precise courses to be laid. It also made it possible to draw up the accurate marine charts known as portulans. An indication of the esteem in which Ahmad ibn Majid was held in his day is that Arab tradition actually ascribes the invention of the compass to him. What he may in fact have done is introduce the housed standing compass affixed to its card. So by Ahmad ibn Majid’s time, technology and economic expansion joined to mark a definitive break with the era before the compass and the axial rudder. Times were changing in other ways too. The foundation of Malacca, the Chinese voyages and the rapid growth of Islamic powers in northern India, Indonesia and the Philippines were all creating new poles of attraction in the East. Small Islamic principalities were springing up in Malaya, Java and Sumatra, and their only links to the Islamic heartland were by sea. Islamic space was expanding eastward, and with it the frontiers of the Islamic economy. Ahmad ibn Majid’s publication of the secrets of Indian Ocean navigation can be seen as one response to this expansion. Vasco da Gama’s epochal voyage around the Cape of Good Hope in 1498 has often been presented as the irruption of a dynamic, technologically advanced western power into an essentially static and backward Asia. Yet the Mediterranean and Indian Ocean worlds in the late 15th century were both responding to common historical forces. When Vasco da Gama’s ship landed in Calicut in 1499 and the two worlds met, it was the visitors from the West who were at an economic and cultural disadvantage, only partially offset by their superior weapons. The Zamorin of Calicut, when showed the gifts brought by the Portuguese—the little bells and beads and the rough cloth—concluded that the Portuguese came from a poor and backward country, and advised them that, next time, they should bring gold. This they did—but even that came not from Portugal, but from Africa. A solar calendar was as necessary for navigation as it was for agriculture. The Islamic lunar calendar could not be used, because there was no correlation between the months and the seasons. In Yemen, the Roman Julian calendar was used for agriculture, and a particular form of the Persian calendar was used as a navigational calendar. It was called the Calendar of Yazdagird, after the last Sasanian monarch, Yazdagird III, who established it in 632. This Persian calendar is of great significance, for it was the calendar used in the Middle Ages by Indian Ocean sailors from the Arabic-speaking world. The earliest evidence for the existence of this navigational calendar is an almanac composed in 1271 by the Rasulid sultan of Yemen, al-Malik al-Ashraf. The almanac is based on much older sources, most probably originating in the Gulf port of Siraf, the crucible of early Islamic Indian Ocean navigation. Siraf was destroyed by an earthquake in 977, and the wealthy merchants, shipowners and navigators of the port emigrated, spreading out along the South Arabian, Red Sea and East African coasts. They took with them their capital, their know-how and their networks of international contacts. This diaspora from Siraf had much to do with the growth of ports like Jiddah and Aden. In East Africa it laid the foundations for what became the ports of Mogadishu, Kilwa and Malindi. The almanac is a perfect example of how the diverse strands of learning that make up classical Islamic civilization were woven into a coherent whole: Month names are in Syriac, derived from Old Babylonian; to these are added Persian month names from the calendar of Yazdagird. The equinoxes and solstices are marked, and the rising and setting of prominent stars and the anwa—constellations whose appearance at dawn heralded rain—are given according to the old Bedouin system. Measurements of shadow lengths throughout the year are included. The days are marked to allow correlation with the Roman Julian calendar. And there is useful information on times to sow and reap, on insect pests, healthy and unhealthy seasons and much more. The almanac also includes the dates of departure and arrival of ships from India, Qalhat, Hormuz, al-Shihr, Mogadishu and Egypt. This flagging of dates significant to both farmers and mariners shows how the prosperity of the Rasulid dynasty was based on both agriculture and trade. The entries in the almanac reveal a highly synchronized system of regular shipping among Aden, East Africa and Egypt. The end of the southwest monsoon came with the spring equinox, on Day 65; the entry for Day 68 (March 16) reads, “End of sailing of Indian ships from India to Aden; no one ventures out after this day.” On Day 100 (April 15), the last fleet from India was scheduled to arrive; the arrival of the first ships of the convoy from Egypt, the karim, was timed to coincide with this. The last ships from Egypt arrived on Day 220 (August 14). 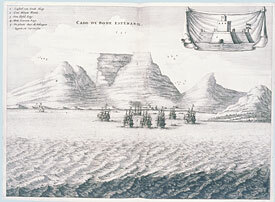 Six days later, ships from Sri Lanka and Coromandel set out on their voyages home. The last sailing out of Aden on the India run during the northeast monsoon was on Day 250 (September 13). And in addition to these major convoys, there were the ships from the Gulf and East Africa—interregional trade that was also tied in with the oceangoing merchant convoys. Historian and Arabist Paul Lunde studied at London University’s School of Oriental and African Studies and specializes in Islamic history and literature. He is the author of Islam: Culture, Faith and History. With Caroline Stone, he has translated Mas‘udi’s Meadows of Gold and—forthcoming this fall from Penguin—Travellers From the Arab World to the Lands of the North, a collection of travel accounts. Lunde is a longtime contributor to this magazine, with some 60 articles to his credit over the past 33 years, including special multi-article sections on Arabic-language printing and the history of the Silk Roads, and the theme issue “The Middle East and the Age of Discovery” (M/J 92). He lives in Seville and Cambridge, England, and is working on an Internet project to map pre-modern Eurasian cultural and intellectual exchanges. He can be reached at [email protected]. This article appeared on pages 45-48 of the July/August 2005 print edition of Saudi Aramco World. Check the Public Affairs Digital Image Archive for July/August 2005 images.